So where am I - honestly, depends what day it is, but as the healing moves forward so does my mental status. I decided to go for NaNo and am so pleased I did, it's helped me focus, and it has come at the right time. I found while I was NWB and PWB the effect of me not being able to do anything meant that I didn't even want to do things that I would normally have enjoyed, including writing. But this week I am back to part normal walking - I have walked, swam, done housework, planned for the month (see last Fridays post) and am actually attacking those targets .......... and have written 16,000 words!!!!!!!! Okay, so they're probably mostly cr*p, but I can deal with that later. YAY!!!!! It sounds like you are just about back to normal then? What a long road it's been! 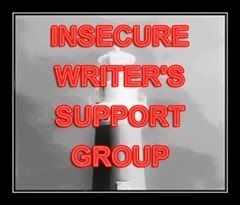 I'm co-hosting IWSG this month, so I'm hitting a bunch of bloggers I've never met before. I'm not sure what you've been through over the last 4 months, but I'm so happy that you are getting better. Even the small things we do can have a big impact. I pray the holiday season is great for you! Sounds like an awesome start to November...keep it up! And thanks for stopping by my #IWSG post. Hi there! I'm doing NaNo this year too, for the first time ever. I'm finding it really challenging, but it is a great method of forcing us to write even when we don't feel like it. I'm also not sure what happened to you in the last four months, but I hope you are feeling better. Thanks for visiting my blog and leaving such a wonderful comment. It's great to meet you! 16 000 words? WOW! You ROCK! I hope and pray that whatever trials and tribulations you've experienced over the past 4 months, is now firmly behind you! From the words in this post, you sound like you're recovering well. I wish you all the best. Keep your positive thoughts and words flowing! Glad to meet you through IWSG. 16000 words is amazing. Go girl! Sounds like you got an awesome head start on NaNo. I'm struggling along with it. Good luck!